Features: Move Free Advanced Plus MSM are made with high-quality ingredients to support FIVE signs of joint health: mobility, flexibility, strength, lubrication, and comfort. * These joint-nourishing tablets contain glucosamine, chondroitin, uniflex, hyaluronic acid, and MSM. 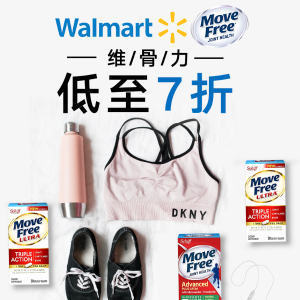 Move Free Advanced Plus MSM, 120 tablets 2 Pack for $25. Move Free Advanced Plus MSM and Vitamin D3, 80 count 2 Packs for $25. Move Free Ultra 2in1 with Comfort Max, 60 tablets (2x30ct Twin Pack) for $41.51. Move Free Ultra Triple Action, 60 count (2x30ct Twin Pack) for $27.73.